iPhone or iPad allow you to make very professional and high-quality photos, but excellent quality may be unnecessary when you publish photos on the Internet or store them on your device. Process all your photos in one click using Photo Resizer and save considerable money on buying additional memory, the Internet and more economical use of your device’s memory. To show photos on your phone it will be enough to set up image resolution no more than 640x860 for iPhone\iPod and 768x1024 for iPad with quality about 70%. To publish on the Internet, in most cases, sufficient resolution 320x480 is quite enough. File size of an original photo is about 3 Mb. After changing the size and quality of a photo you will get a new file size that is no more than 30-300 kB. You should save original photos in iCloud or on the computer and remove them from the device. This will allow you to increase the amount of images, stored on your device, as much as 10-100 times. 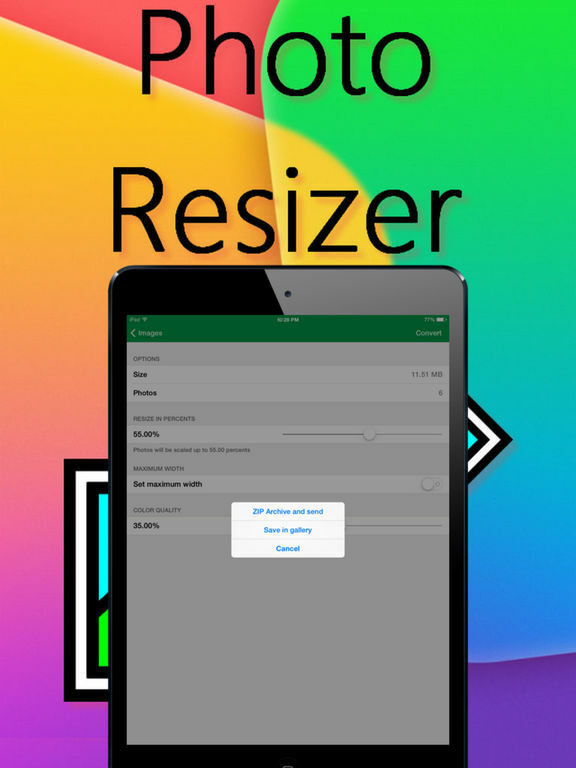 Photo Resizer is an easy-to-use utility that simultaneously produces resizing and\or the quality of the photos stored on your device. 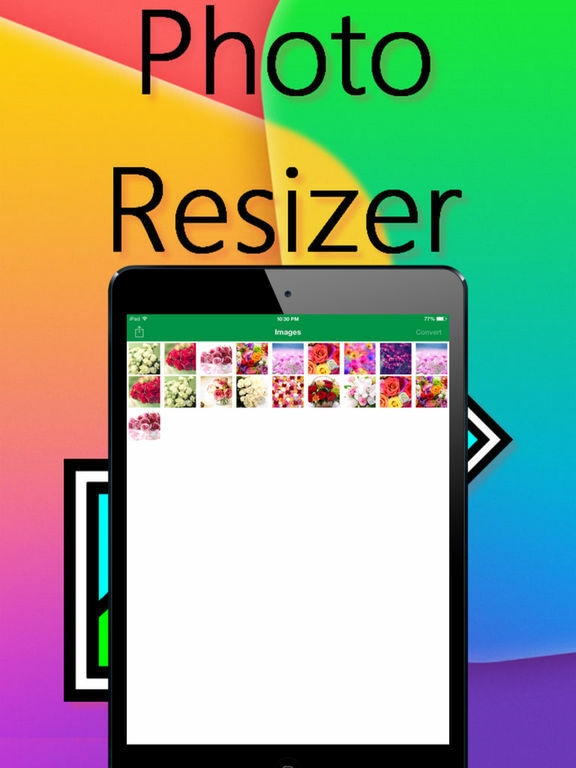 Photo Resizer can significantly reduce the size of your photos to publish on popular Internet resources, social networks. With Photo Resizer you have an opportunity to create a single zip archive photo file and send photos to your friends via E-Mail. Photo Resizer doesn’t remove original photos after converting. Photo Resizer can perform operations on converting a single, selected, or all images simultaneously.